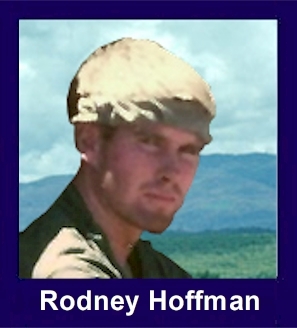 The 35th Infantry Regiment Association salutes our fallen brother, SP4 Rodney Louis Hoffman, who died in the service of his country on August 13th, 1967 in Quang Ngai Province, Vietnam. The cause of death was listed as Booby Trap. At the time of his death Rodney was 19 years of age. He was from Denver, Colorado. Rodney is honored on the Vietnam Veterans Memorial at Panel 24E, Line 106. The decorations earned by SP4 Rodney Louis Hoffman include: the Combat Infantryman Badge, the Bronze Star with V, the Purple Heart, the National Defense Service Medal, the Vietnam Service Medal, the Vietnam Campaign Medal and the Vietnam Cross of Gallantry with Palm Unit Citation. Your dad and my dad were buddies in ND. Met you once when your family visited us- Dad said you were a "wild guy". But he and mom went to Denver for your funeral. They didnt want me exposed to "the war". Then Nixon drafted me in 1970, right out of college. So I saw Khe Sahn, Phu Bai, Can Tho, and the Mekong for myself, not as a grunt, but in aviation maintenance. Met your dad at the San Fransico airport and flew to Denver with him, and got the United Airlines tour. Stayed overnite in your room. Your mom said, "Well, I guess this is a homecoming of sorts." Your dad helped my dad over the years of growing up in ND. In several ways, you have helped me over the years with dealing with Vietnam. Im kind of a "wild guy" myself, and proud of my service. When I touched your name on the Wall some years ago, I guess it means that youve touched me. Thanks, Cousin, Buddy. For heroism in connection with military operations against an armed hostile force in the Republic of Vietnam. On 7 August 1967 Specialist Four Hoffman distinguished himself while serving as a Rifleman in A, 1/35th Infantry. His platoon was on a combat patrol near La Van when it came across a trail leading through the underbrush. Specialist Four Hoffman and several others were left to watch the trail while the rest of the unit scouted the area nearby. Moving along the trail, the lead man of the group entered a mine field and was wounded before he realized where he was. Disregarding the extreme danger, Specialist Four Hoffman ran forward into the mined area with another man to retrieve his wounded comrade. He and the other soldier had picked up the man and were making their way back to the rest of the team when he was mortally wounded by the explosion of a mine. Specialist Four Hoffmans unselfish and heroic action at the cost of his life is in keeping with the highest traditions of the military service and reflects great credit upon himself, his unit, and the United States Army.